Apple Hostel Letterkenny kohteessa Letterkenny, Irlanti: Varaa nyt! Apple property is centrally located in the vibrant town of Letterkenny. We are a super friendly property in a great location offering full self-catering facilities free Wi-Fi and good quality accommodation at cheap budget prices. 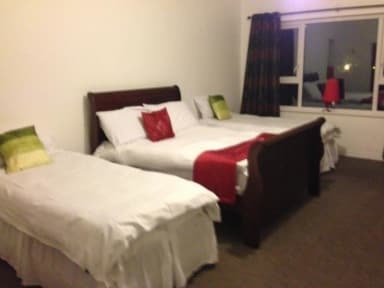 We have a wide range of comfortable and affordable accommodation ranging from multi bedrooms, family room, and private double rooms en suite triple rooms and single room. Our barbecue area is nestled in our luscious gardens which are a great place to enjoy a great atmosphere. You can also enjoy your stay with us by joining some of our great pub crawls, You can find information regarding these excursions on arrival at reception . After experiencing the magic of this captivating county, you might enjoy some traditional music and food at one of the many renowned pubs or restaurants. We are located a few minute's walk from Letterkenny town centre and 100 meters from 'An Grianan Theatre' which offers a very diverse programme of events throughout the year. 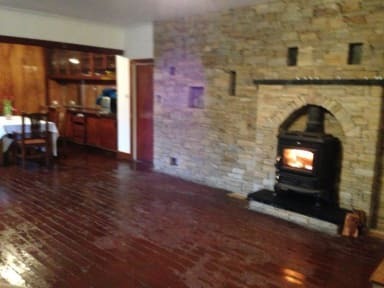 We are a spacious purpose built property and offer a unique backpacker experience and a true Donegal escapism. We are in an area of Letterkenny renowned for its immense scenic beauty. Apple property is surrounded by mature landscaped gardens and a beautiful display of wild birds guaranteed to bring a tranquil air to your vacation. Check-in from 14:00 - 20.00 Please contact us directly to arrange check in after this time. We accept payment by cash. The rooms, like the rest of the hostel, where nice and clean. The staff were kind, helpful and always ready to keep company, only wishing the best of their guests. To be all honest, only thing I did find lacking was a towel for hands in the restroom and no paper towels in the kitchen (or maybe I just didn't find them? Could be possible..) If anyone is planning to spend their night in Letterkenny, I recommend staying in Apple Hostel! Definitely worth the money and suitable for all budgets.